Chelsea will have to splash out if they wish to extend Gonzalo Higuain’s stay at Stamford Bridge beyond this season, as confirmed by Juventus. As noted by BBC Sport, the 31-year-old has joined the Blues on loan for the rest of the season, after his previous agreement with AC Milan was cut short. 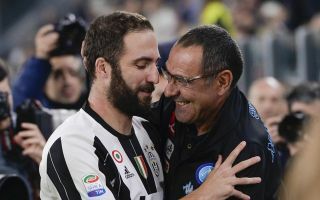 In turn, Maurizio Sarri will hope that his former Napoli star can fire them towards their objectives over the next few months, with Chelsea looking to secure a top-four finish in the Premier League as well as claim trophies both domestically and with the Europa League still on the agenda. However Juventus have released a statement confirming the fees involved in the Higuain deal, albeit they haven’t clarified how much the Argentine international will cost Chelsea for this season alone. As per Sky Sports, Milan were set to pay €18m for the season-long loan deal with Juve, and so perhaps with half the season remaining, Chelsea may have essentially picked up that same agreement and will pay the remaining €9m. However, that is merely speculative at this stage. What has been confirmed though via Juve’s official press release, is that if Chelsea wish to extend Higuain’s loan move for another season this summer, that will cost them €18m, or they could choose to sign Higuain on a permanent basis for €36m, which would be paid over two years. It remains to be seen if the prolific striker delivers at Stamford Bridge in the next few months to warrant an extended stay with Chelsea, but if he does score regularly and prove that he’s capable of leading the line successfully, it sets up an interesting decision for the Blues as to whether to exercise one of those options on a player well into his 30s. Having bagged a staggering 38 goals in just 42 games under Sarri in the 2015/16 campaign in Naples, the Italian tactician will be hoping they can enjoy similar productivity this time round, which would surely make signing the Argentine a no-brainer from Chelsea’s perspective.